Excellent news that reconfirms the prestigious awards won this year was received from Jet2holidays, where they awarded our hotel the Quality Award for 2017, based on customers reviews. 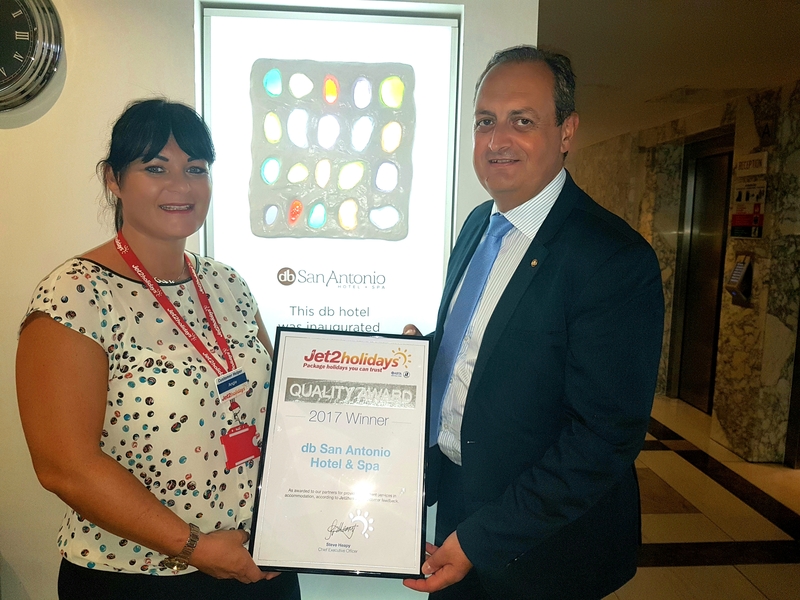 Bradley Dingli, General Manager db San Antonio Hotel + Spa, said that this Quality Award given by Jet2holidays is the most reliable benchmark of excellence that we offer. "I would like to thank our past and repeat guests for their feedback on our hotel services. This award has been won through the commitment of all our staff members as well as the continuous support and investment of our owners. The fact that we are winning these awards year after year also point to the consistency of our excellent service. These awards give us great satisfaction and strengthen our commitment to continue to deliver the very best to each and every guest who spends their hard earned holidays with us," said Mr, Dingli. Photo: Sales & Marketing Manager John Messina receiving award from Angela Holmes, Destination Manager – Malta, Jet2Holidays.